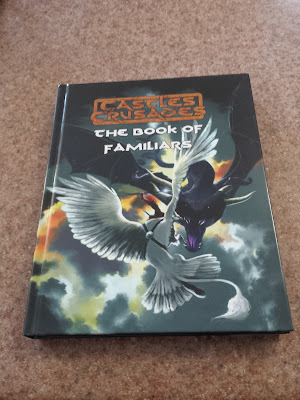 Picked up a new book from Troll Lords over the weekend to add to my Castles & Crusades collections. The Book of Familiars is a great book and one I have reviewed in the past. Makes me wish I had a regular C&C game going. I added it to a bunch of my other "witch" themed books. Collecting all my books, games and adventures for the War of the Witch Queens and I am working out a time and a place to set it. With the release of Dark Albion it occurs to me again that Medieval England would be the best place to start. I was digging through some of the material I had written for the WitchCraft RPG many years ago under the project title "WitchCraft: The Burning Times" and found just a treasure trove of notes and ideas. But mostly it was essential in putting down a good time for all this. I am going to opt for the early 17th Century. While I certainly would have loved to have had Queen Elizabeth in the mix, King James is a better choice. Though with the inclusion of Baba Yaga and Lamia (Keats and Waterhouse can't be wrong) I will have to expand it to the rest of the world. It is looking more and more like I am going to have to go with Castles & Crusades for War of the Witch Queens and not Astonishing Swordsmen & Sorcerers of Hyperborea like I originally wanted.